On your site, you’ll probably have a few articles that are most dear to your heart. Articles you desperately want people to read. Articles you want people to find with Google. At Yoast, we call these articles your cornerstone articles. How does the Yoast SEO plugin help you set up a cornerstone content strategy? I’ll tell you all about that in this blog post. Cornerstone content consists of those articles that you’re most proud of. The articles that reflect the mission of your company perfectly, and the ones you definitely want to rank well. In general, cornerstone articles are lengthy, and they tend to be informative. Perhaps you’ve never given much thought to using a cornerstone content strategy. It is worth your time, though! Think about the posts or pages on your site. Which are most precious to you? Which articles are the most complete and authoritative? Choose these to be your cornerstone content. 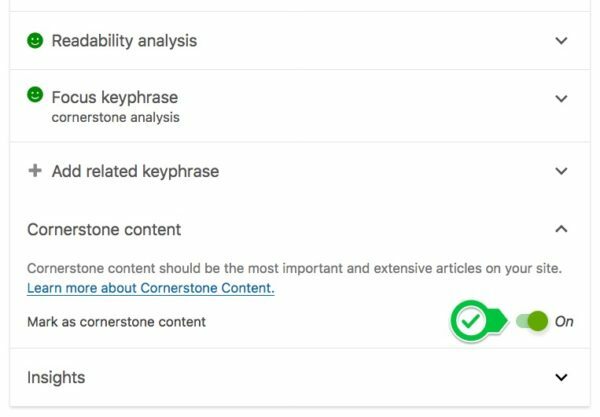 What does Yoast SEO do with cornerstone content? Cornerstone content should be lengthy, well-written and well-optimized. Cornerstone articles should have a prominent place in your site’s structure. You should keep your cornerstones fresh and up to date. Yoast SEO will help you take care of all of these things! The SEO and readability analysis in Yoast SEO will give you feedback on your writing. If you consider a post to be one of your cornerstone content articles, you should toggle the switch to ‘on’ in the ‘cornerstone content’ tab, underneath the ‘focus keyphrase’ tab. Indicating that an article is cornerstone content, will make the SEO analysis and the readability analysis a bit more strict. For example, we propose to write at least 300 words for a normal post. If a post is cornerstone content, we urge you to write at least 900 words. Our SEO analysis will help you optimize your blog post for the search engines. For cornerstone content, you have to go the extra mile. Make sure you use your focus keyphrase enough, mention it in a few headings, and optimize your images. Readability is equally important, though. Our readability analysis helps you to, for instance, use enough headings and to write in short, easy-to-read sentences and paragraphs. You have to link to your cornerstone articles to make them rank high in the search engines. By linking to your favorite articles often, you’ll tell Google that these are the ones that are most important. Think of it as a map: big cities have considerably more roads leading towards them than small towns. Those cities are your cornerstones. They should receive most links. The small towns are your posts on more specific topics. If you build your site structure like this, you won’t be competing with your own content for a place in the search engines. 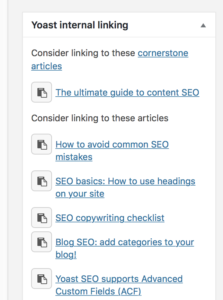 Yoast SEO has two useful features to help you link to your cornerstone content articles. If you use our premium plugin, you can use our internal linking tool. This tool will make linking suggestions for other posts based on the words you’re using in your post. The posts you’ve marked as cornerstone content articles – as described previously – will always appear on top of our list of suggestions. That way, whenever you’re writing about a specific topic, you’ll find the right cornerstone article to link to. Read more about how to use the Yoast SEO internal linking tool. Using our internal linking tool will remind you to link to your cornerstones whenever you’re writing a new post. As a result, your cornerstones will stay on top in your linking structure. And that’s what they need to start ranking. The text link counter allows you to see all the internal links you’ve put in a post and all internal links to a post from your other pages. This tool provides you with a clear overview of the distribution of your internal links. Make sure to check (and keep checking) if your cornerstone articles receive enough internal links! Regularly updating your cornerstone content is important for your cornerstone strategy. After all, your cornerstones should be timeless, and therefore, always contain the latest insights. If you have Yoast SEO Premium installed, you’ll have an additional feature to help you keep your cornerstones up to date. The stale cornerstone content filter allows you to see at a glance which of your cornerstones need updating. It works in both your post overview, and your pages overview. Neat, right? Your cornerstone content strategy consists of several elements. Your cornerstone content articles should be informative, nice to read and well-optimized. In addition to that, they should have a prominent place in your site’s structure. Yoast SEO helps you achieve both these things. And last but not least, the Premium plugin helps you keep your cornerstones fresh and up to date. Don’t skimp on optimizing your cornerstones: they deserve that little bit of extra attention! The post How to set up a cornerstone content strategy with Yoast SEO appeared first on Yoast.